We recently redesigned our hydraulic trailer jacks to make them even more heavy duty and versatile. Our new Monster Jacks® are now built with 5″ x 5″ tubing and have a truly “monstrous” jack foot. This new foot design greatly improves operation in mud and sand, by increasing the surface area of the foot. These jacks come with all the same great features like a Interstate Deep Cycle Battery, KTI Pump, Parker Hoses, and an integrated battery charger. Save some time and your back by upgrading to Monster Jacks® on your next PJ gooseneck trailer. Trailer theft is a major issue in North America. Statistics show that an estimated 30,000+ trailers are stolen every year in the US alone. To help reduce trailer theft, we have partnered up with the folks at WHRZT! (pronounced Where’s it) to offer their GPS Trailer Tracker on PJ Trailers. This tracker is incredibly simple to install and easy to use. This tracker has geofencing capabilities, tracking in google maps, text & email notifications, and more. Check out the video below to see how it works. 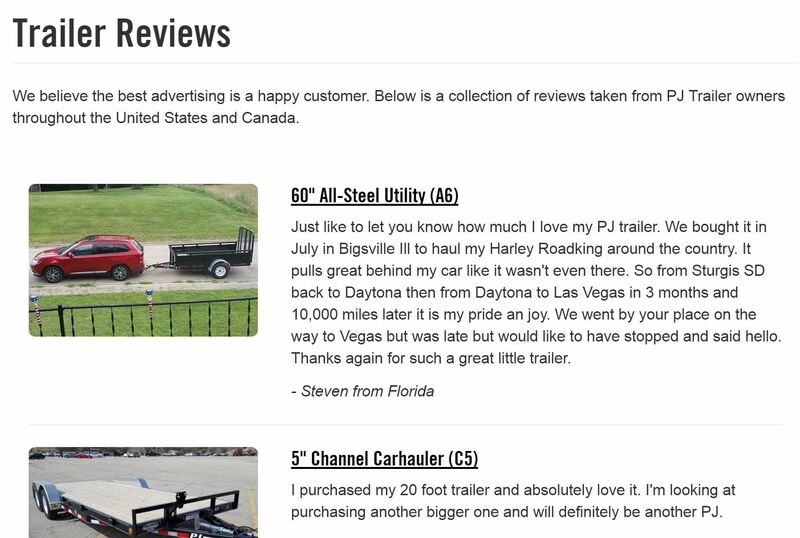 At PJ Trailers we think a great review is the best advertising. We have built a dedicated page for utility trailer reviews. We’ve tried to include customer photos and links to the trailer models when available. If you would like to submit a trailer review, let us know! Every year at PJ Trailers we build thousands of utility trailers just for side by side owners. Not only do we design & manufacture trailers, but we are also avid UTV users and build our utility trailers with UTVs in mind. We believe our unique positions as trailer designers and UTV owners allows us to make the best UTV Trailers on the market. We recently created a dedicated guide for UTV Trailers on our website. This guideline outlines trailer models, lengths, and widths that are best suited for a side by side trailer. The guide will walk you through many of the popular options for UTV & ATV trailers, like side ATV ramps and solid sides. Our recently launched Ready Rail system will be incredibly valuable to UTV owners. This system allows you have tie down points through out the entire bed. It also allows you to quickly add accessories like cooler racks and bed dividers. We are excited to the announce the release of a game changing system for PJ Trailers. Ready Rail is a patent pending utility trailer rail system that allows the user to customize their trailer to their needs through a series of bolt-on trailer accessories. One of the greatest uses is adding Ready Rings. These quick attaching d-rings can be moved throughout the trailer anywhere there is a Ready Rail upright. With Ready Rings you will always have a perfect tie-down point for your cargo. Ready Rail trailers can be easily modified as your needs over the life of the trailer change. Accessories like spare tire mounts and landscape tool boxes can be added in just minutes. Ready Rail equipped trailers are now being delivered daily to PJ dealers throughout the US and Canada. Whether you are looking for the ultimate skidsteer trailer or hauling other heavy equipment, a low boy tilt is hard to beat for easy of loading. At PJ Trailers we recently launched our latest HD equipment tilt, called the TJ. It is equipped with two (2) Dexter 8,000 lbs Torsion Oil Bath axles. The TJ tilt with a bumper pull coupler has a GVWR of 16,000 lbs. To complement the low 12 degree load angle, the TJ also has an ultra-wide 82″ inside fender width to accommodate extra wide equipment. The TJ has four (4) 235/85/R16 Provider radial 14 ply tires with a 4,400 lbs load limit. Our customers love our super popular knife edge tilt design, which makes loading forklifts and scissor lifts so easy. The trailer also includes many other PJ staples like a 3 year frame warranty, lifetime LED lights, 10k drop leg jack, and a Bargman 7 way plug. Last Fall we launched the new full width rubber infused lumber, called Blackwood Pro. This new decking option includes rubber across the entire width of the board, allowing for maximum traction. This product is available exclusively on open trailers through PJ Trailers. It has been most popular on tilt and hydraulic dovetail models. We have also seen increasing popularity on equipment and gooseneck trailers for improved load securement. Our customers also love the durability and great looks of Blackwood decked trailer. Authorized PJ Trailers dealers Renville Sales, Inc in Minnesota sent in these great pictures of a PJ T6 tilt with Blackwood Pro decking and Orange Powder Coat.